Since the 1700s, increases in average living standards became a permanent feature of economic life in many countries. This was associated with the emergence of a new economic system called capitalism, in which private property, markets and firms play a major role. Under this new way of organizing the economy, advances in technology and specialization in products and tasks raised the amount that could be produced in a day’s work. This process, which we call the capitalist revolution, has been accompanied by growing threats to our natural environment, and by unprecedented global economic inequalities. Economics is the study of how people interact with each other, and with the natural environment, in producing their livelihoods. At the time of Ibn Battuta’s travels, India was not richer than the other parts of the world. But India was not much poorer, either. An observer at the time would have noticed that people, on average, were better off in Italy, China and England than in Japan or India. But the vast differences between the rich and the poor, which the traveller would have noted wherever he went, were much more striking than these differences across regions. Rich and poor would often have different titles: in some places they would be feudal lords and serfs, in others royalty and their subjects, slave owners and slaves, or merchants and the sailors who transported their goods. Then—as now—your prospects depended on where your parents were on the economic ladder and whether you were male or female. The difference in the fourteenth century, compared with today, was that back then the part of the world in which you were born mattered much less. Fast forward to today. The people of India are far better off than they were seven centuries ago if we think about their access to food, medical care, shelter and the necessities of life, but by world standards today most are poor. Ibn Battuta (1304–1368) was a Moroccan traveller and merchant. His travels, which lasted 30 years, took him across north and west Africa, eastern Europe, the Middle East, south and central Asia and China. Figure 1.1a tells some of the story. To compare living standards in each country, we use a measure called GDP per capita. People obtain their incomes by producing and selling goods and services. GDP (gross domestic product) is the total value of everything produced in a given period such as a year, so GDP per capita corresponds here to average annual income. GDP is also referred to as gross domestic income. In Figure 1.1a the height of each line is an estimate of average income at the date on the horizontal axis. 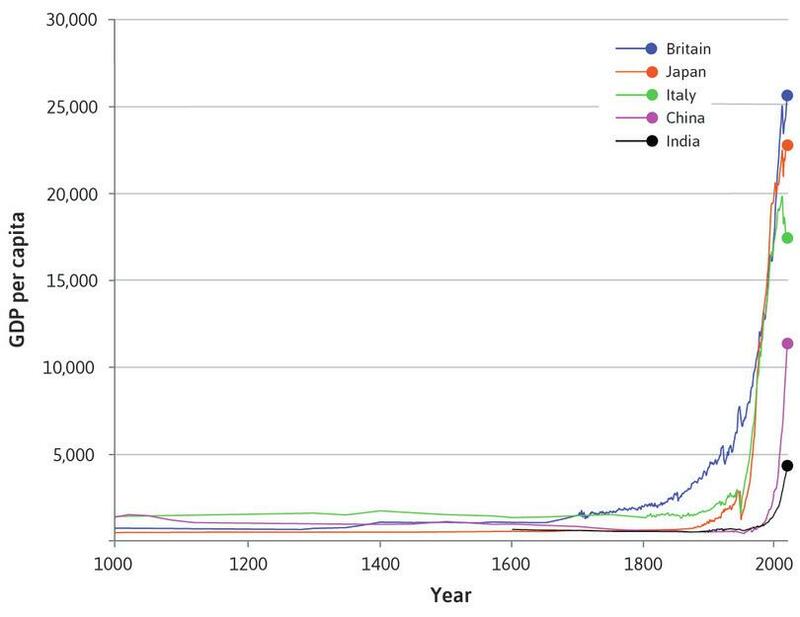 Figure 1.1a History’s hockey stick: Gross domestic product per capita in five countries (1000–2015). On average, people are six times better off in Britain than in India by this measure. Japanese people are as rich as the British, just as they were in the fourteenth century, but now Americans are even better off than the Japanese, and Norwegians are better off still. 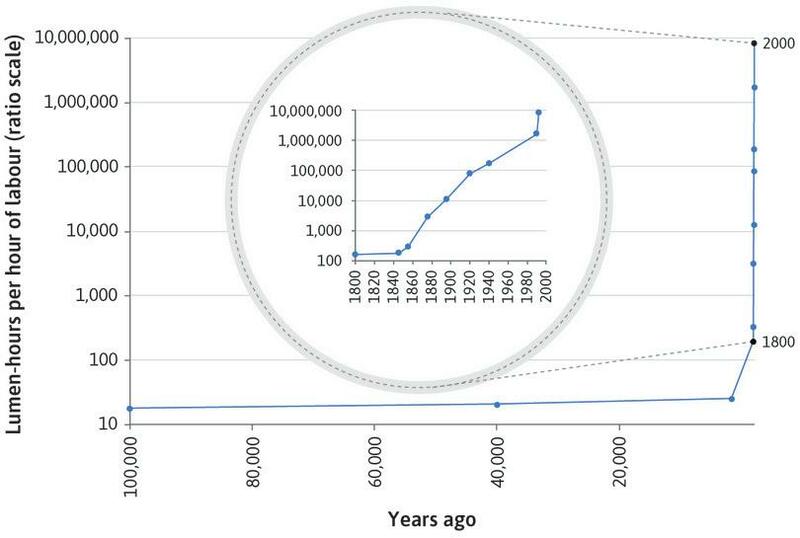 We can draw the graph in Figure 1.1a because of the work of Angus Maddison who dedicated his working life to finding the scarce data needed to make useful comparisons of how people lived across more than 1,000 years (his work is continuing in the Maddison Project). In this course you will see that data like this about regions of the world, and the people in it, is the starting point of all economics. 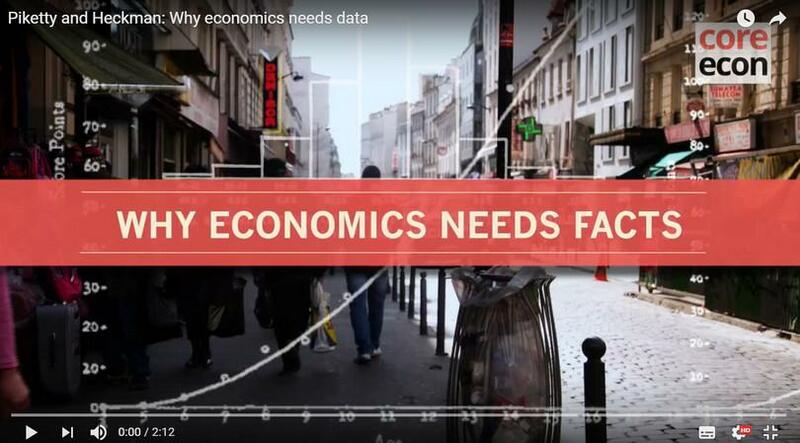 In our video, the economists James Heckman and Thomas Piketty explain how collecting data has been fundamental to their work on inequality and the policies to reduce it. A thousand years ago the world was flat, economically speaking. 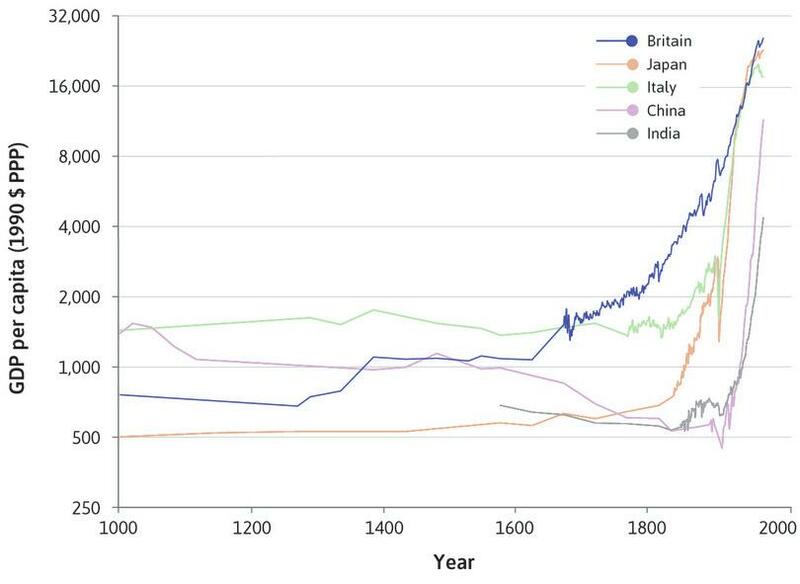 There were differences in income between the regions of the world; but as you can see from Figure 1.1a, the differences were small compared to what was to follow. Nobody thinks the world is flat today, when it comes to income. Figure 1.2 shows the distribution of income across and within countries. Countries are arranged according to GDP per capita from the poorest on the left of the diagram (Liberia), to the richest on the right (Singapore). The width of each country’s bars represents its population. For every country there are ten bars, corresponding to the ten deciles of income. The height of each bar is the average income of 10% of the population, ranging from the poorest 10% of people at the front of the diagram to the richest 10% at the back, measured in 2005 US dollars. Note that this doesn’t mean ‘the richest 10% of income earners’. It is the richest 10% of people, where each person in a household, including children, is assumed to have an equal share of the household’s income. The skyscrapers (the highest columns) at the back of the right-hand side of the figure represent the income of the richest 10% in the richest countries. The tallest skyscraper is the richest 10% of people in Singapore. In 2014, this exclusive group had an income per capita of more than $67,000. Norway, the country with the second highest GDP per capita, does not have a particularly tall skyscraper (it is hidden between the skyscrapers for Singapore and the third richest country, the US) because income is more evenly distributed in Norway than in some other rich countries. The analysis in Figure 1.2 shows how the distribution of income has changed since 1980. Countries are ranked by GDP per capita from left to right. For each country the heights of the bars show average income for deciles of the population, from the poorest 10% at the front to the richest 10% at the back. The width of the bar indicates the country’s population. Figure 1.2 Countries are ranked by GDP per capita from left to right. For each country the heights of the bars show average income for deciles of the population, from the poorest 10% at the front to the richest 10% at the back. The width of the bar indicates the country’s population. The interactive graphic and data to download are available here. In Singapore, the richest country on the furthest right, the average incomes of the richest and poorest 10% are $67,436 and $3,652 respectively. In Liberia, the furthest left, the corresponding incomes are $994 and $17. Figure 1.2a In Singapore, the richest country on the furthest right, the average incomes of the richest and poorest 10% are $67,436 and $3,652 respectively. In Liberia, the furthest left, the corresponding incomes are $994 and $17. The skyscraper bars in the back right of the figure are the richest 10% in some of the richest countries. Figure 1.2b The skyscraper bars in the back right of the figure are the richest 10% in some of the richest countries. In 1980 the ranking of countries by GDP was different. The poorest countries, coloured darkest red, were Lesotho and China. The richest (darkest green) were Switzerland, Finland and then the US. At that time the skyscrapers were not as tall: the differences between the richest 10% and the rest of a country’s population were not as pronounced. Figure 1.2c In 1980 the ranking of countries by GDP was different. The poorest countries, coloured darkest red, were Lesotho and China. The richest (darkest green) were Switzerland, Finland and then the US. At that time the skyscrapers were not as tall: the differences between the richest 10% and the rest of a country’s population were not as pronounced. You can see from the colours that some countries changed their ranking between 1980 and 1990. China (dark red) is now richer; Uganda, also red, is in the middle of the distribution amongst countries coloured yellow. Some taller skyscrapers have appeared: inequality increased in many countries during the 1980s. Figure 1.2d You can see from the colours that some countries changed their ranking between 1980 and 1990. China (dark red) is now richer; Uganda, also red, is in the middle of the distribution amongst countries coloured yellow. Some taller skyscrapers have appeared: inequality increased in many countries during the 1980s. By 2014, many countries have changed their ranking. China has grown rapidly since 1990. But the countries that were richest in 1980 (darkest green) are still near the top in 2014. Figure 1.2e By 2014, many countries have changed their ranking. China has grown rapidly since 1990. But the countries that were richest in 1980 (darkest green) are still near the top in 2014. Income distributions have become more unequal in many of the richer countries: some very tall skyscrapers have appeared. In the middle-income countries, too, there is a big step up at the back of the figure: the incomes of the richest 10% are now high relative to the rest of the population. Figure 1.2f Income distributions have become more unequal in many of the richer countries: some very tall skyscrapers have appeared. In the middle-income countries, too, there is a big step up at the back of the figure: the incomes of the richest 10% are now high relative to the rest of the population. Two things are clear from the 2014 distribution. First, in every country, the rich have much more than the poor. A handy measure of inequality in a country is called the 90/10 ratio, which we define here as the average income of the richest 10% divided by the average income of the poorest 10%. It is more commonly defined as the income of the 90th percentile divided by that of the 10th percentile. Even in a relatively equal country such as Norway, the 90/10 ratio is 5.4; in the US it is 16 and in Botswana in southern Africa it is 145. Inequality within the very poorest countries is difficult to see in the graph, but it is definitely there: the 90/10 ratio is 22 in Nigeria, and 20 in India. The second thing that jumps out from Figure 1.2 is the huge difference in income between countries. Average income in Norway is 19 times the average income in Nigeria. And the poorest 10% in Norway receive almost twice the income of the richest 10% in Nigeria. Imagine the traveller Ibn Battuta’s journey across regions of the world in the fourteenth century and think of how this would have looked in a diagram like Figure 1.2. He would of course notice that everywhere he went there were differences between the richest and poorest groups in the popu­lation of each region. He would report back that the differences in income between the countries of the world were relatively minor by comparison. 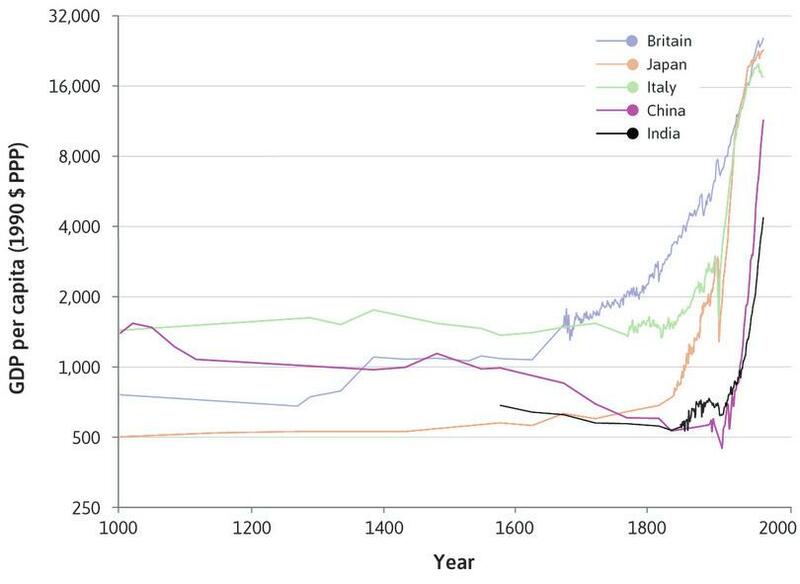 Countries that took off economically before 1900 (Figure 1.1a) are in the ‘skyscraper’ part of Figure 1.2. The vast differences in income between the countries of the world today take us back to Figure 1.1a, where we can begin to understand how this came about. The countries that took off economically before 1900—UK, Japan, Italy—are now rich. They (and countries like them) are in the skyscraper part of Figure 1.2. The countries that took off only recently, or not at all, are in the flatlands. What do you think a ‘skyscraper’ figure like Figure 1.2 would have looked like at the time of Ibn Battuta (early to mid-fourteenth century)? You can see the interactive graph and download the spreadsheet data that we used to create Figure 1.2. Choose five countries that you are interested in. For each one calculate the 90/10 ratio in 1980, 1990 and 2014. Describe the differences between countries and the changes over time that you find. Can you think of any explanations for them? The estimate of living standards that we used in Figure 1.1a (GDP per capita) is a measure of the total goods and services produced in a country (called gross domestic product, or GDP), which is then divided by the country’s population. Listen to Diane Coyle talking about the benefits and limitations of measuring GDP. Adding up these millions of services and products requires finding some measure of how much a yoga class is worth compared to a toothbrush. Economists must first decide what should be included, but also how to give a value to each of these things. In practice, the easiest way to do this is by using their prices. When we do this, the value of GDP corresponds to the total income of everyone in the country. Dividing by the population gives GDP per capita—the average income of people in a country. But is that the right way to measure their living standards, or wellbeing? GDP per capita measures average income, but that is not the same as the disposable income of a typical person. Disposable income is the amount of wages or salaries, profit, rent, interest and transfer payments from the government (such as unemployment or disability benefits) or from others (for example, gifts) received over a given period such as a year, minus any transfers the individual made to others (including taxes paid to the government). Disposable income is thought to be a good measure of living standards because it is the maximum amount of food, housing, clothing and other goods and services that the person can buy without having to borrow—that is, without going into debt or selling possessions. Is our disposable income a good measure of our wellbeing? The quality of our social and physical environment such as friendships and clean air. The amount of free time we have to relax or spend time with friends and family. Goods and services that we do not buy, such as healthcare and education, if they are provided by a government. Goods and services that are produced within the household, such as meals or childcare (predominantly provided by women). When we’re part of a group of people (a nation for example, or an ethnic group) is the average disposable income a good measure of how well off the group is? Consider a group in which each person initially has a disposable income of $5,000 a month, and imagine that, with no change in prices, income has risen for every individual in the group. Then we would say that average or typical wellbeing had risen. But now think about a different comparison. In a second group, the monthly disposable income of half the people is $10,000. The other half has just $500 to spend every month. The average income in the second group ($5,250) is higher than in the first (which was $5,000 before incomes rose). But would we say that the second group’s wellbeing is greater than that of the first group, in which everyone has $5,000 a month? The additional income in the second group is unlikely to matter much to the rich people, but the poor half would think their poverty was a serious deprivation. Absolute income matters for wellbeing, but we also know from research that people care about their relative position in the income distribution. They report lower wellbeing if they find they earn less than others in their group. Since income distribution affects wellbeing, and because the same average income may result from very different distributions of income between rich and poor within a group, average income may fail to reflect how well off a group of people is by comparison to some other group. GDP includes the goods and services produced by the government, such as schooling, national defence, and law enforcement. They contribute to wellbeing but are not included in disposable income. In this respect, GDP per capita is a better measure of living standards than disposable income. But government services are difficult to value, even more so than services such as haircuts and yoga lessons. For goods and services that people buy we take their price as a rough measure of their value (if you valued the haircut less than its price, you would have just let your hair grow). But the goods and services produced by government are typically not sold, and the only measure of their value to us is how much it cost to produce them. But when the changes over time or differences among countries in this indicator are as great as those in Figure 1.1a (and in Figures 1.1b, 1.8 and 1.9 later in this unit), GDP per capita is undoubtedly telling us something about the differences in the availability of goods and services. Exercise 1.3 What should we measure? Read his speech in full or listen to a sound recording of it. In the full text, which goods does he list as being included in a measure of GDP? Do you think these should be included in such a measure, and why? Which goods does he list in the full text as missing from the measure? Do you think they should be included, and why? What does UK GDP per capita measure? ‘Per capita’ means per person, and not in the capital city! Disposable income is a person’s income (for example wages, interests on savings, benefits) minus any transfers (for example tax). GDP includes the goods and services produced by the government, such as schooling, national defence and law enforcement, which are not included in disposable income. This is called the GNP (Gross National Product) per capita. GNP adds the output produced abroad attributable to UK residents, and subtracts UK output attributable to residents abroad. This is the correct definition of GDP per capita as defined in Section 1.2. We need to separate the thing we want to measure—changes or differences in amounts of goods and services—from things that are not relevant to the comparison, especially changes or differences in the prices of the goods and services. When comparing output in one country at two points in time, it is necessary to take into account differences in prices between the two points in time. When comparing output between two countries at a point in time, it is necessary to take into account differences in prices between the two countries. Notice how similar the last two statements are. Measuring changes in output at different points in time presents the same challenges as we face when we try to compare countries by measuring differences in their output at the same time. The challenge is to find a set of prices to use in this calculation that will allow us to identify changes or differences in outputs, without making the mistake of assuming that if the price of something rises in a country, but not in another, then the amount of output has increased in the country. Where pi is the price of good i, qi is the quantity of good i, and ∑ indicates the sum of price times quantity for all the goods and services that we count. To gauge whether the economy is growing or shrinking, we need a measure of the quantity of goods and services purchased. This is called real GDP. If we compare the economy in two different years, and if all the quantities stay the same but the prices increase by, say, 2% from one year to the next, then nominal GDP rises by 2%, but real GDP is unchanged. The economy has not grown. Because we cannot add together the number of computers, shoes, restaurant meals, flights, fork-lift trucks, and so on, it is not possible to measure real GDP directly. Instead, to get an estimate of real GDP, we have to begin with nominal GDP as defined above. On the right-hand side of the equation for nominal GDP are the prices of each item of final sales multiplied by the quantity. To track what is happening to real GDP, we begin by selecting a base year: for example, the year 2010. We then define real GDP using 2010 prices as equal to nominal GDP that year. The following year, nominal GDP for 2011 is calculated as usual using the prices prevailing in 2011. Next, we can see what has happened to real GDP by multiplying the 2011 quantities by the 2010 prices. If, using the base year prices, GDP has gone up, we can infer that real GDP has increased. If this method produces the result that, when computed using 2010 prices, GDP in 2011 is the same as in 2010, we can infer that although there might have been a change in the composition of output (fewer flights taken but more computers sold, for example), the overall quantity of output of goods and services has not changed. The conclusion would be that real GDP, which is also called GDP at constant prices, is unchanged. The growth rate of the economy in real terms is zero. To compare countries, we need to choose a set of prices and apply it to both countries. To begin with, imagine a simple economy which produces only one product. As an example, we choose a regular cappuccino because we can easily find out the price of this standard product in different parts of the world. And we choose two economies that are very different in their level of development: Sweden and Indonesia. At the time we wrote this, when prices are converted into US dollars using current exchange rates, a regular cappuccino costs $3.90 in Stockholm and $2.63 in Jakarta. If you want the up-to-date statistic a website called Numbeo shows cost-of-living comparisons. But simply expressing the two cappuccinos in a common currency is not enough, because the international current exchange rate that we used to get these numbers is not a very good measure of how much a rupiah will buy in Jakarta and how much a krona will get you in Stockholm. This is why when comparing living standards across countries, we use estimates of GDP per capita in a common set of prices known as purchasing power parity (PPP) prices. As the name suggests, the idea is to achieve parity (equality) in the real purchasing power. Prices are typically higher in richer countries—as in our example. One reason for this is that wages are higher, which translates into higher prices. Because prices of cappuccinos, restaurant meals, haircuts, most types of food, transport, rents and most other goods and services are more expensive in Sweden than in Indonesia, once a common set of prices is applied, the difference between GDP per capita in Sweden and Indonesia measured at PPP is smaller than it is if the comparison is made at current exchange rates. At current exchange rates, GDP per capita in Indonesia is only 6% of the level of Sweden; at PPP where the comparison uses international prices, GDP per capita in Indonesia is 21% of the level of Sweden. What this comparison shows is that the buying power of the Indonesian rupiah compared to the Swedish krona is more than three times greater than would be indicated by the current exchange rate between the two currencies. We will examine the measurement of GDP (and other measures of the whole economy) in more detail in Unit 13. If you have never have seen an ice-hockey stick (or experienced ice hockey) this shape is why we call these figures ‘hockey-stick curves’. A different way of looking at the data in Figure 1.1a is to use a scale that shows GDP per capita doubling as we move up the vertical axis (from $250 per capita per year to $500, then to $1,000, and so on). This is called a ratio scale and is shown in Figure 1.1b. The ratio scale is used for comparing growth rates. Whether we want to compare levels or growth rates depends on the question we are asking. 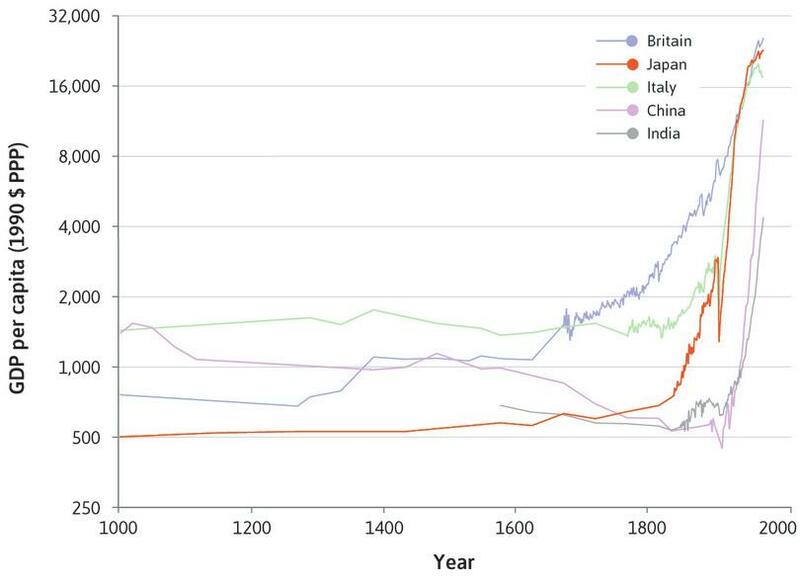 Figure 1.1a makes it easy to compare the levels of GDP per capita across countries, and at different times in history. Figure 1.1b uses a ratio scale, which makes it possible to compare growth rates across countries and at different periods. When a ratio scale is used, a series that grows at a constant rate looks like a straight line. This is because the percentage (or proportional growth rate) is constant. A steeper line in the ratio scale chart means a faster growth rate. To see this, think of a growth rate of 100%: that means the level doubles. In Figure 1.1b, with the ratio scale, you can check that if GDP per capita doubled over 100 years from a level of $500 to $1,000, the line would have the same slope as a doubling from $2,000 to $4,000 dollars, or from $16,000 to $32,000 over 100 years. If, instead of doubling, the level quadrupled (from say, $500 to $2,000 over 100 years), the line would be twice as steep, reflecting a growth rate that was twice as high. There were cultural changes and scientific advances in many parts of the world over the entire period shown in the figure, but living standards only began to rise in a sustained way from the eighteenth century onwards. The figure looks like a hockey stick, and our eyes are drawn to the kink. 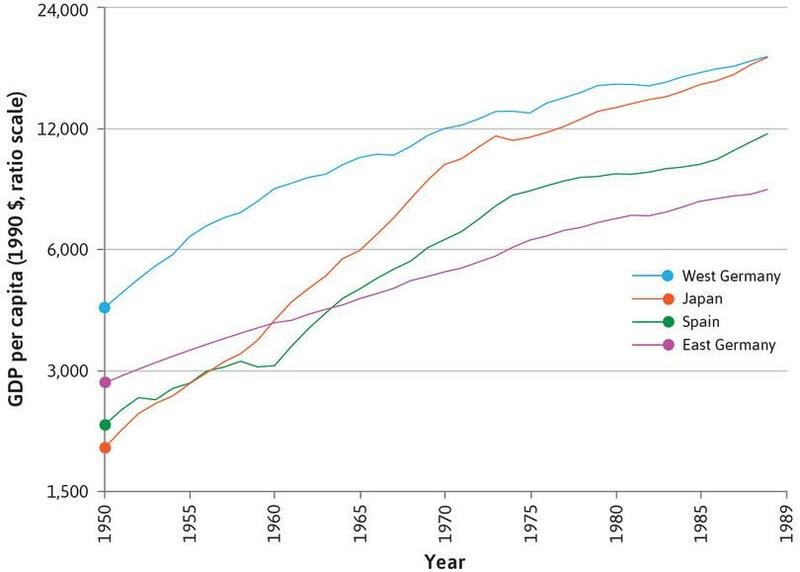 Figure 1.1b History’s hockey stick: Living standards in five countries (1000–2015) using the ratio scale. For the period before 1800 we have less information about GDP per capita, which is why there are fewer data points in that part of the figure. Figure 1.1ba For the period before 1800 we have less information about GDP per capita, which is why there are fewer data points in that part of the figure. For each country the data points shown at the previous step have been joined with straight lines. Before 1800 we can’t see how living standards fluctuated from year to year. Figure 1.1bb For each country the data points shown at the previous step have been joined with straight lines. Before 1800 we can’t see how living standards fluctuated from year to year. 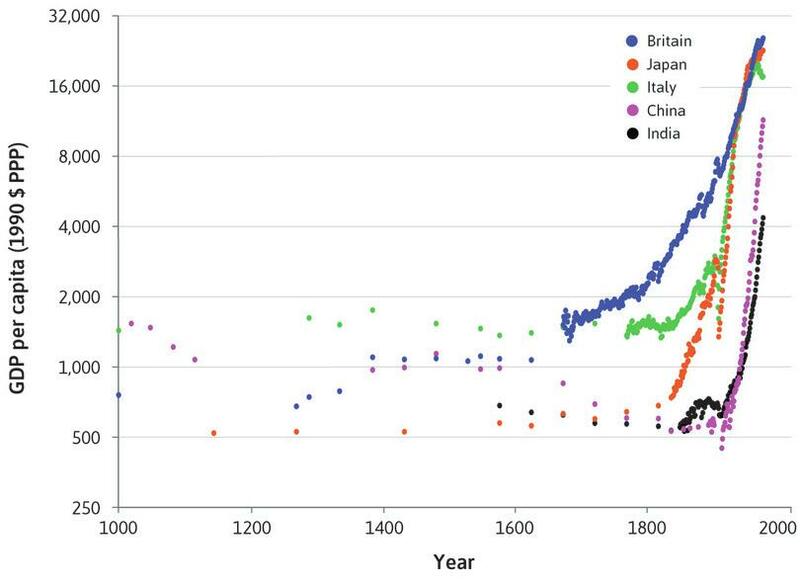 Figure 1.1bc The hockey-stick kink is less abrupt in Britain, where growth began around 1650. In Japan the kink is more defined, occurring around 1870. Figure 1.1bd In Japan the kink is more defined, occurring around 1870. The kink for China and India happened in the second half of the twentienth century. GDP per capita actually fell in India during British colonial rule. You can see that this is also true of China during the same period, when European nations dominated China’s politics and economics. Figure 1.1be The kink for China and India happened in the second half of the twentienth century. GDP per capita actually fell in India during British colonial rule. You can see that this is also true of China during the same period, when European nations dominated China’s politics and economics. Figure 1.1bf The ratio scale makes it possible to see that recent growth rates in Japan and China were higher than elsewhere. India: According to Angus Deaton, an economist who specializes in the analysis of poverty, when 300 years of British rule of India ended in 1947: ‘It is possible that the deprivation in childhood of Indians … was as severe as that of any large group in history’. In the closing years of British rule, a child born in India could expect to live for 27 years. Fifty years on, life expectancy at birth in India had risen to 65 years. China: It had once been richer than Britain, but by the middle of the twentieth century GDP per capita in China was one-fifteenth that of Britain. Latin America: Neither Spanish colonial rule, nor its aftermath following the independence of most Latin American nations early in the nineteenth century, saw anything resembling the hockey-stick upturn in living standards experienced by the countries in Figures 1.1a and 1.1b. For a very long time, living standards did not grow in any sustained way. When sustained growth occurred, it began at different times in different countries, leading to vast differences in living standards around the world. An entertaining video by Hans Rosling, a statistician, shows how some countries got richer and healthier much earlier than others. He travelled throughout Europe, visiting Toulouse, France where he claimed to have ‘very little to do’ and thus began ‘to write a book in order to pass away the time.’ This was to become the most famous book in economics. In An Inquiry into the Nature and Causes of the Wealth of Nations, published in 1776, Smith asked: how can society coordinate the independent activities of large numbers of economic actors—producers, transporters, sellers, consumers—often unknown to each other and widely scattered across the world? His radical claim was that coordination among all of these actors might spontaneously arise, without any person or institution consciously attempting to create or maintain it. This challenged previous notions of political and economic organization, in which rulers imposed order on their subjects. Even more radical was his idea that this could take place as a result of individuals pursuing their self-interest: ‘It is not from the benevolence of the butcher, the brewer, or the baker that we expect our dinner, but from their regard to their own interest,’ he wrote. But such an enormous number of pins could only find buyers if they were sold far from their point of production. Hence specialization was fostered by the construction of navigable canals and the expansion of foreign trade. And the resulting prosperity itself expanded the ‘extent of the market’, in a virtuous cycle of economic expansion. He specifically targeted monopolies that were protected by governments, such as the British East India Company that not only controlled trade between India and Britain, but also administered much of the British colony there. He agreed with his contemporaries that a government should protect its nation from external enemies, and ensure justice through the police and the court system. He also advocated government investment in education, and in public works such as bridges, roads, and canals. Smith is often associated with the idea that prosperity arises from the pursuit of self-interest under free market conditions. However, his thinking on these issues was far more nuanced than he is given credit for. Figure 1.1a used a conventional scale for the vertical axis, and Figure 1.1b used a ratio scale. For Britain, identify a period of time when its growth rate was increasing and another period in which its growth rate was roughly constant. Which figure did you use, and why? Identify a period during which GDP per capita was shrinking (a negative growth rate) faster in Britain than in India. Which figure did you use and why? Imagine that the GDP per capita of a country had doubled every 100 years. You are asked to draw both linear and ratio scale graphs that plot GDP on the vertical axis, and the year on the horizontal axis. What will be the shapes of the curves? Note: Linear scale graphs are ‘normal’ graphs in which the difference in height between 1 and 2, and the difference between 2 and 3, would be the same on the vertical axis. An upward-sloping straight line on a ratio scale graph means that the growth rate of the GDP per capita is constant. An upward-sloping convex curve on a linear scale graph means that the GDP per capita increases by a greater and greater amount in absolute terms over time, consistent with a positive constant growth rate. An upward-sloping straight line on a linear scale graph means that the GDP per capita increases by the same amount every year. A straight horizontal line on a ratio scale graph means that the GDP per capita is constant over the years. An upward-sloping straight line on a linear scale graph means that the GDP per capita increases by the same amount every year. An upward-sloping concave curve on a ratio scale graph means that the growth rate decreases each year. Here the growth rate is constant. An upward-sloping convex curve on a ratio scale graph means that the growth rate increases each year. Here the growth rate is constant. The science fiction show Star Trek is set in the year 2264, when humans travel the galaxy with friendly aliens aided by intelligent computers, faster-than-light propulsion, and replicators that create food and medicine on demand. Whether we find the stories silly or inspiring, most of us, in optimistic moods, can entertain the idea that the future will be transformed morally, socially, and materially by technological progress. No Star Trek future awaited the peasant’s grandchildren of 1250. The next 500 years would pass without any measurable change in the standard of living of an ordinary working person. While science fiction began to appear in the seventeenth century (Francis Bacon’s New Atlantis being one of the first, in 1627), it was not until the eighteenth century that each new generation could look forward to a different life that was shaped by new technology. Remarkable scientific and technological advances occurred more or less at the same time as the upward kink in the hockey stick in Britain in the middle of the eighteenth century. Important new technologies were introduced in textiles, energy and transportation. Its cumulative character led to it being called the Industrial Revolution. As late as 1800, traditional craft-based techniques, using skills that had been handed down from one generation to the next, were still used in most production processes. The new era brought new ideas, new discoveries, new methods and new machines, making old ideas and old tools obsolete. These new ways were, in turn, made obsolete by even newer ones. In everyday usage, ‘technology’ refers to machinery, equipment and devices developed using scientific knowledge. In economics, technology is a process that takes a set of materials and other inputs—including the work of people and machines—and creates an output. For example, a technology for making a cake can be described by the recipe that specifies the combination of inputs (ingredients such as flour, and labour activities such as stirring) needed to create the output (the cake). Another technology for making cakes uses large-scale machinery, ingredients and labour (machine operators). Until the Industrial Revolution, the economy’s technology, like the skills needed to follow its recipes, was updated only slowly and passed from generation to generation. As technological progress revolutionized production, the time required to make a pair of shoes fell by half in only a few decades; the same was true of spinning and weaving, and of making cakes in a factory. This marked the beginning of a permanent technological revolution because the amount of time required for producing most products fell generation after generation. To get some idea of the unprecedented pace of change, consider the way we produce light. For most of human history technological progress in lighting was slow. Our distant ancestors typically had nothing brighter than a campfire at night. The recipe for producing light (had it existed) would have said: gather lots of firewood, borrow a lighting stick from some other place where a fire is maintained, and start and maintain a fire. The first great technological breakthrough in lighting came 40,000 years ago, with the use of lamps that burned animal or vegetable oils. We measure technological progress in lighting by how many units of brightness called lumens could be generated by an hour of work. One lumen is approximately the amount of brightness in a square metre of moonlight. One lumen-hour (lm-hr) is this amount of brightness lasting an hour. For example, creating light by a campfire took about 1 hour of labour to produce 17 lm-hr, but animal fat lamps produced 20 lm-hr for the same amount of work. In Babylonian times (1750 BC) the invention of an improved lamp using sesame oil meant that an hour of labour produced 24 lm-hr. Technological progress was slow: this modest improvement took 7,000 years. Three thousand years later, in the early 1800s, the most efficient forms of lighting (using tallow candles) provided about nine times as much light for an hour of labour as had the animal fat lamps of the past. Since then lighting has become more and more efficient with the development of town gas lamps, kerosene lamps, filament bulbs, fluorescent bulbs and other forms of lighting. Compact fluorescent bulbs introduced in 1992 are about 45,000 times more efficient, in terms of labour time expended, than lights were 200 years ago. Today the productivity of labour in producing light is half a million times greater than it was among our ancestors around their campfire. Figure 1.3 charts this remarkable hockey-stick growth in efficiency in lighting using the ratio scale we introduced in Figure 1.1b. Lumen-hours per hour of labour (100,000 years ago to the present). Figure 1.3 The productivity of labour in producing light. Transformational technological change is still occurring. Hans Rosling claims that we should say ‘thank you industrialization’ for creating the washing machine, a device that transformed the wellbeing of millions of women. The process of innovation did not end with the Industrial Revolution, as the case of labour productivity in lighting shows. It has continued with the application of new technologies in many industries, such as the steam engine, electricity, transportation (canals, railroads, automobiles), and most recently, the revolution in information processing and communication. These broadly applicable technological innovations give a particularly strong impetus to growth in living standards because they change the way that large parts of the economy work. 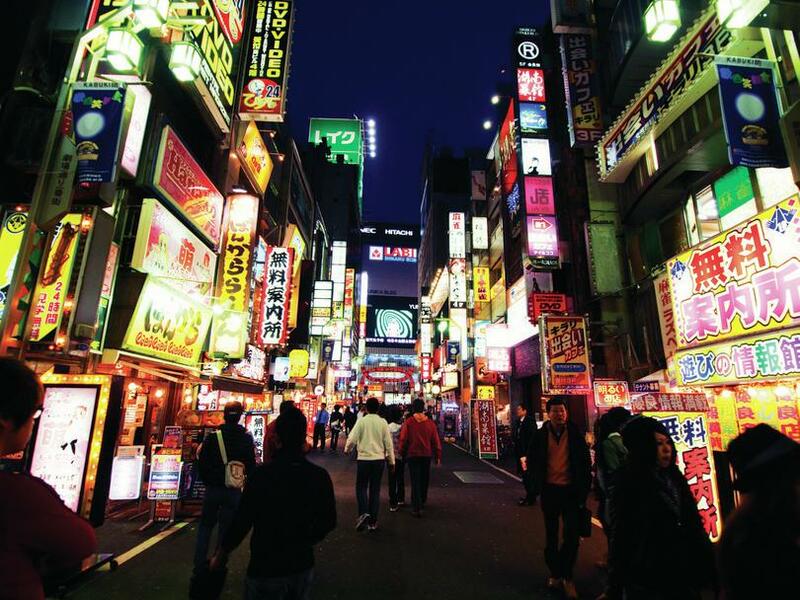 In July 2012, the Korean hit ‘Gangnam Style’ was released. By the end of 2012 it had become the best-selling song in 33 countries, including Australia, Russia, Canada, France, Spain and the UK. With 2 billion views by the middle of 2014, ‘Gangnam Style’ also became the most watched video on YouTube. The permanent technological revolution has produced a connected world. Everyone is part of it. The materials making up this introduction to economics were written by teams of economists, designers, programmers and editors, working together—often simultaneously—at computers in the UK, India, the US, Russia, Colombia, South Africa, Chile, Turkey, France and many other countries. If you are online, some of the transmission of information occurs at close to the speed of light. While most of the commodities traded around the globe still move at the pace of an ocean freighter, about 21 miles (33 km) per hour, international financial transactions are implemented in less time than it took you to read this sentence. The speed at which information travels provides more evidence of the novelty of the permanent technological revolution. By comparing the known date of a historical event with the date at which the event was first noted in other locations (in diaries, journals or newspapers) we can determine the speed at which news travelled. When Abraham Lincoln was elected US president in 1860, for example, the word was spread by telegraph from Washington to Fort Kearny, which was at the western end of the telegraph line. From there the news was carried by a relay of riders on horseback called the Pony Express, covering 1,260 miles (2,030 km) to Fort Churchill in Nevada, from where it was transmitted to California by telegraph. The process took seven days and 17 hours. Over the Pony Express segment of the route, the news travelled at 7 miles (11 km) per hour. A half-ounce (14 gram) letter carried over this route cost $5, or the equivalent of five days’ wages. 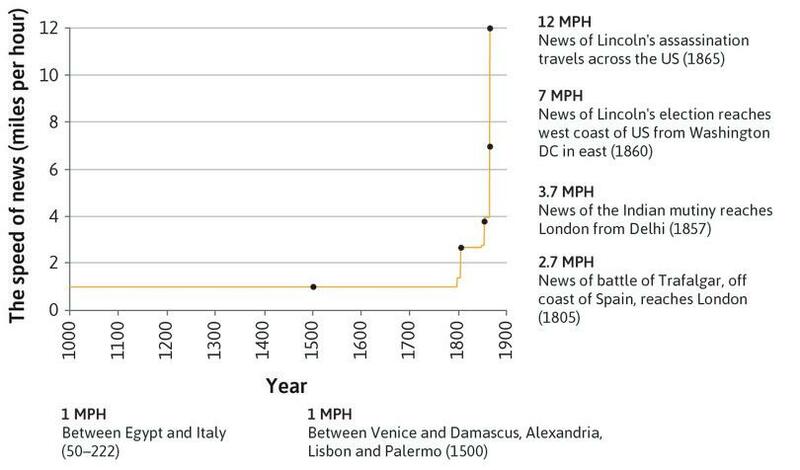 From similar calculations we know that news travelled between ancient Rome and Egypt at about 1 mile (1.6 km) per hour, and 1,500 years later between Venice and other cities around the Mediterranean it was, if anything, slightly slower. But, a few centuries later, as Figure 1.4 shows, the pace began to quicken. It took ‘only’ 46 days for the news of a mutiny of Indian troops against British rule in 1857 to reach London, and readers of the Times of London knew of Lincoln’s assassination only 13 days after the event. One year after Lincoln’s death a transatlantic cable cut the time for news to travel between New York and London to a matter of minutes. Figure 1.4 The speed at which information travelled (1000–1865). Humans have always relied on their environment for the resources they need to live and produce their livelihoods: the physical environment and the biosphere, which is the collection of all forms of life on earth, provide essentials for life such as air, water and food. The environment also provides the raw materials that we use in the production of other goods—such as wood, metals, and oil. Figure 1.5 shows one way of thinking about the economy: it is part of a larger social system, which is itself part of the biosphere. People interact with each other, and also with nature, in producing their livelihood. Figure 1.5 The economy is part of society, which is part of the biosphere. Through most of their history, humans have regarded natural resources as freely available in unlimited quantities (except for the costs of extracting them). But as production has soared (see Figures 1.1a and 1.1b), so too have the use of our natural resources and degradation of our natural environment. Elements of the ecological system such as air, water, soil, and weather have been altered by humans more radically than ever before. The most striking effect is climate change. Figures 1.6a and 1.6b present evidence that our use of fossil fuels—coal, oil, and natural gas—has profoundly affected the natural environment. After having remained relatively unchanged for many centuries, increasing emissions of carbon dioxide (CO₂) into the air during the twentieth century have resulted in measurably larger amounts of CO₂ in the earth’s atmosphere (Figure 1.6a) and brought about perceptible increases in the northern hemisphere’s average temperatures (Figure 1.6b). 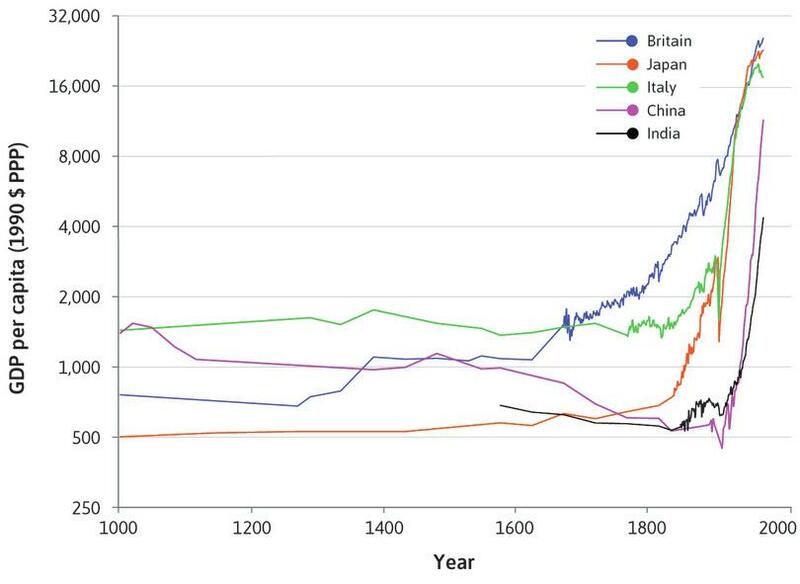 Figure 1.6a also shows that CO₂ emissions from fossil fuel consumption have risen dramatically since 1800. Exercise 1.5 How much difference does a couple of degrees warmer or colder make? Between 1300 and 1850 there were a number of exceptionally cold periods as you can see from Figure 1.6b. Research this so-called ‘little ice age’ in Europe and answer the following. Describe the effects of these exceptionally cold periods on the economies of these countries. Within a country or region, some groups of people were exceptionally hard hit by the climate change while others were less affected. Provide examples. Figure 1.6b shows that the average temperature of the earth fluctuates from decade to decade. Many factors cause these fluctuations, including volcanic events such as the 1815 Mount Tambora eruption in Indonesia. Mount Tambora spewed so much ash that the earth’s temperature was reduced by the cooling effect of these fine particles in the atmosphere, and 1816 became known as the ‘year without a summer’. Figure 1.6a Carbon dioxide in the atmosphere (1010–2010) and global carbon emissions from burning fossil fuels (1750–2010). Since 1900, average temperatures have risen in response to increasingly high levels of greenhouse gas concentrations. These have mostly resulted from the CO₂ emissions associated with the burning of fossil fuels. Figure 1.6b Northern hemisphere temperatures over the long run (1000–2006). The human causes and the reality of climate change are no longer widely disputed in the scientific community. The likely consequences of global warming are far-reaching: melting of the polar ice caps, rising sea levels that may put large coastal areas under water, and potential changes in climate and rain patterns that may destroy the world’s food-growing areas. The long-term physical and economic consequences of these changes, and the appropriate policies that governments could adopt as a result, are discussed in detail in Unit 20 (Economics of the environment). The authoritative source for research and data about climate change is the Intergovernmental Panel on Climate Change. Climate change is a global change. But many of the environmental impacts of burning fossil fuels are local, as residents of cities suffer respiratory and other illnesses as a result of high levels of harmful emissions from power plants, vehicles, and other sources. Rural communities, too, are impacted by deforestation (another cause of climate change) and the depletion of the supply of clean water and fishing stocks. From global climate change to local resource exhaustion, these effects are results of both the expansion of the economy (illustrated by the growth in total output) and the way the economy is organized (what kinds of things are valued and conserved, for example). The relationship between the economy and the environment shown in Figure 1.5 is two-way: we use natural resources in production, which may in turn affect the environment we live in and its capacity to support future production. But the permanent technological revolution—which brought about dependence on fossil fuels—may also be part of the solution to today’s environmental problems. Look back at Figure 1.3, which showed the productivity of labour in producing light. The vast increases shown over the course of history and especially since the mid-nineteenth century occurred largely because the amount of light produced per unit of heat (for example from a campfire, candle, or light bulb) increased dramatically. In lighting, the permanent technological revolution brought us more light for less heat, which conserved natural resources—from firewood to fossil fuels—used in generating the heat. Advances in technology today may allow greater reliance on wind, solar and other renewable sources of energy. See Figure 1.6a. The growth in atmospheric CO₂ began from the mid-nineteenth century as a consequence of the burning of fossil fuels as the technologies introduced in the Industrial Revolution spread. How can we explain the change from a world in which living conditions changed little unless there was an epidemic or a war, to one in which each generation is noticeably, and predictably, better off than the previous one? Figure 1.7 Mention of the word ‘capitalism’ in New York Times articles (1851–2015). Calculations by Simon DeDeo, Santa Fe Institute, from New York Times. 2016. ‘NYT article archive’. Capitalism is an economic system characterized by a particular combination of institutions. An economic system is a way of organizing the production and distribution of goods and services in an entire economy. And by institutions, we mean the different sets of laws and social customs regulating production and distribution in different ways in families, private businesses, and government bodies. In some economies in the past, the key economic institutions were private property (people owning things), markets (where goods could be bought and sold) and families. Goods were usually produced by families working together, rather than by firms with owners and employees. In other societies, the government has been the institution controlling production, and deciding how goods should be distributed, and to whom. This is called a centrally planned economic system. It existed, for example, in the Soviet Union, East Germany and many other eastern European countries prior to the end of Communist Party rule in the early 1990s. Though governments and families are essential parts of the workings of every economy, most economies today are capitalist. Since most of us live in capitalist economies, it is easy to overlook the importance of institutions that are fundamental for capitalism to work well. They are so familiar, we hardly ever notice them. Before seeing how private property, markets and firms combine in the capitalist economic system, we need to define them. Over the course of human history, the extent of private property has varied. In some societies, such as the hunters and gatherers who are our distant ancestors, almost nothing except personal ornaments and clothing was owned by individuals. In others, crops and animals were private property, but land was not. The right to use the land was granted to families by consensus among members of a group, or by a chief, without allowing the family to sell the plot. In other economic systems some human beings—slaves—were private property. In a capitalist economy, an important type of private property is the equipment, buildings, raw materials, and other inputs used in producing goods and services. These are called capital goods. Private property may be owned by an individual, a family, a business, or some entity other than the government. Some things that we value are not private property: for example, the air we breathe and most of the knowledge we use cannot be owned or bought and sold. In the Soviet era Russia your land could be transferred to others by the state and hence was not private property. Shares in a company represent a claim to that company’s future profits; this claim can be sold, gifted, or realized as the owner wishes and represents income to which non-shareholders are not entitled. While intellectual property is private property (of your company, your university or yourself), your skills in general are not disposable to others for them to become the owners. They are reciprocated: unlike gifts and theft, one person’s transfer of a good or service to another is directly reciprocated by a transfer in the other direction (either of another good or service as in barter exchange, or money, or a promise of a later transfer when one buys on credit). They are voluntary: Both transfers—by the buyer and the seller—are voluntary because the things being exchanged are private property. So the exchange must be beneficial in the opinion of both parties. In this, markets differ from theft, and also from the transfers of goods and services in a centrally planned economy. In most markets there is competition. A seller charging a high price, for example, will find that buyers prefer to buy from other competing sellers. What are the similarities and differences between that social networking site and a market? The owners sell the goods and services on markets with the intention of making a profit. But private property and markets alone do not define capitalism. In many places they were important institutions long before capitalism. The most recent of the three components making up the capitalist economy is the firm. The kinds of firms that make up a capitalist economy include restaurants, banks, large farms that pay others to work there, industrial establishments, supermarkets, and internet service providers. Other productive organizations that are not firms and which play a lesser role in a capitalist economy include family businesses, in which most or all of the people working are family members, non-profit organizations, employee-owned cooperatives, and government-owned entities (such as railways and power or water companies). These are not firms, either because they do not make a profit, or because the owners are not private individuals who own the assets of the firm and employ others to work there. Note: a firm pays wages or salaries to employees but, if it takes on unpaid student interns, it is still a firm. Firms existed, playing a minor role, in many economies long before they became the predominant organizations for the production of goods and services, as in a capitalist economy. The expanded role of firms created a boom in another kind of market that had played a limited role in earlier economic systems: the labour market. Firm owners (or their managers) offer jobs at wages or salaries that are high enough to attract people who are looking for work. In economic language, the employers are the demand side of the labour market (they ‘demand’ employees), while the workers are the supply side, offering to work under the direction of the owners and managers who hire them. A striking characteristic of firms, distinguishing them from families and governments, is how quickly they can be born, expand, contract and die. A successful firm can grow from just a few employees to a global company with hundreds of thousands of customers, employing thousands of people, in a few years. Firms can do this because they are able to hire additional employees on the labour market, and attract funds to finance the purchase of the capital goods they need to expand production. Contrast this with a successful family farm. The family will be better off than its neighbours; but unless it turns the family farm into a firm, and employs other people to work on it, expansion will be limited. If, instead, the family is not very good at farming, then it will simply be less well off than its neighbours. The family head cannot dismiss the children as a firm might get rid of unproductive workers. As long as the family can feed itself there is no equivalent mechanism to a firm’s failure that will automatically put it out of business. Government bodies also tend to be more limited in their capacity to expand if successful, and are usually protected from failure if they perform poorly. In everyday language, the word ‘capitalism’ is used in different ways, in part because people have strong feelings about it. In the language of economics, we use the term in a precise way because that helps us to communicate: we define capitalism as an economic system combining three institutions, each of which we need in turn to define. ‘Capitalism’ refers not to a specific economic system, but to a class of systems sharing these characteristics. How the institutions of capitalism—private property, markets, and firms—combine with each other and with families, governments, and other institutions differs greatly across countries. Just as ice and steam are both ‘water’ (defined chemically as a compound of two hydrogen atoms bonded with one oxygen atom), China and the US are both capitalist economies. But they differ in the extent to which the government influences economic affairs, and in many other ways. As this demonstrates, definitions in the social sciences often cannot be as precise as they are in the natural sciences. Some people might say that ‘ice is not really water’, and object that the definition is not the ‘true meaning’ of the word. But debates about the ‘true’ meaning (especially when referring to complex abstract ideas like capitalism, or democracy) forget why definitions are valuable. Think of the definition of water, or of capitalism, not as capturing some true meaning—but rather as a device that is valuable because it makes it easier to communicate. Definitions in the social sciences often cannot be as precise as they are in the natural sciences. Unlike water, we cannot identify a capitalist economic system using easy-to-measure physical characteristics. Look again at Figure 1.7. Can you suggest an explanation for why the usage of the term capitalism spikes when it does? Why do you think it has remained so high since the late 1980s? Figure 1.8 shows that the three parts of the definition of a capitalist economic system are nested concepts. The left-hand circle describes an economy of isolated families who own their capital goods and the goods they produce, but have little or no exchange with others. A capitalist economy adds firms to a market economy built on family-centred enterprises and private property. Figure 1.8 Capitalism: Private property, markets and firms. Inputs and outputs are private property: The firm’s buildings, equipment, patents, and other inputs into production, as well as the resulting outputs, belong to the owners. Historically, economies like the left-hand circle have existed, but have been much less important than a system in which markets and private property are combined (the middle circle). Private property is an essential condition for the operation of markets: buyers will not want to pay for goods unless they can have the right to own them. In the middle circle most production is done either by individuals (shoemakers or blacksmiths, for example) or in families (for example, on a farm). Prior to 1600 a great many of the economies of the world were like this. The distinctive hallmark of the capitalist economic system is the private ownership of capital goods that are organized for use in firms. Other economic systems are distinctive because of the importance of privately owned land, the presence of slaves, because the government owns capital goods, or because of the limited role of firms. Capitalist economies differ, too, from earlier economies in the magnitude of the capital goods used in production. Massive power looms have replaced spinning wheels; a tractor now pulls a plough to do a job once done by a farmer using a hoe. Capitalism is an economic system that combines centralization with decentralization. It concentrates power in the hands of owners and managers of firms who are then able to secure the cooperation of large numbers of employees in the production process. But it limits the powers of owners and of other individuals, because they face competition to buy and sell in markets. So when the owner of a firm interacts with an employee, he or she is ‘the boss’. But when the same owner interacts with a potential customer he or she is simply another person trying to make a sale, in competition with other firms. It is this unusual combination of competition among firms, and concentration of power and cooperation within them, that accounts for capitalism’s success as an economic system. How could capitalism lead to growth in living standards? As we have seen, the permanent technological revolution coincided with the transition to firms as the predominant means of organizing production. This does not mean that firms necessarily caused technological change. But firms competing with each other in markets had strong incentives to adopt and develop new and more productive technologies, and to invest in capital goods that would have been beyond the reach of small-scale family enterprises. The growth of firms employing large numbers of workers—and the expansion of markets linking the entire world in a process of exchange—allowed historically unprecedented specialization in the tasks and products on which people worked. In the next section, we will see how this specialization can raise labour productivity and living standards. Exercise 1.9 Firm or not? Look around at the objects in your workspace. Do you know the person who made them? What about your clothing? Or anything else in sight from where you are sitting? 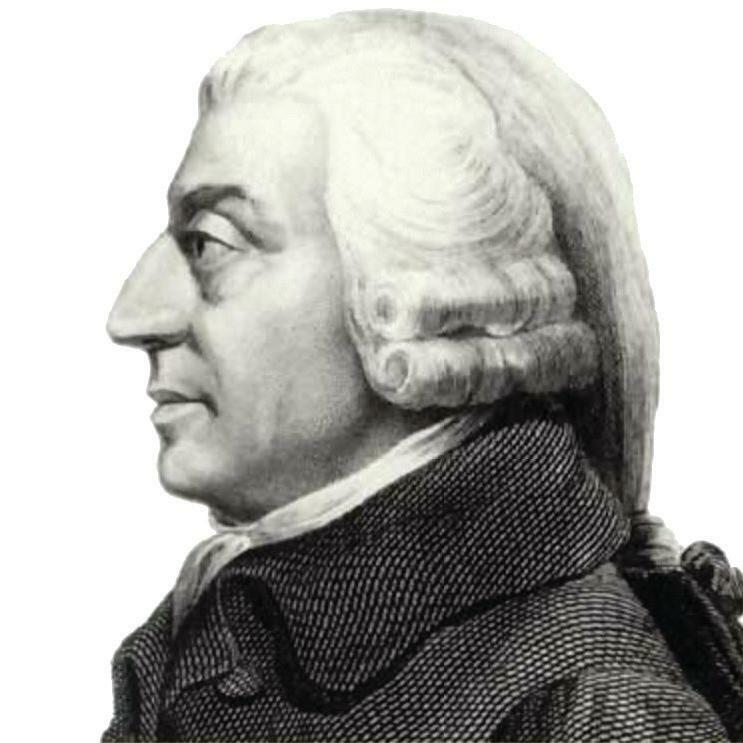 Now imagine that it is 1776, the year that Adam Smith wrote The Wealth of Nations. The same questions, asked anywhere in the world, would have had a different answer. At that time many families produced a wide array of goods for their own use, including crops, meat, clothing, even tools. Many of the things that you might have spotted in Adam Smith’s day would have been made by a member of the family, or of the village. You would have made some objects yourself; others would have been made locally and purchased from the village market. economies of scale: Producing a large number of units of some good is often more cost-effective than producing a smaller number. We investigate this in more detail in Unit 7. These are the advantages of working on a limited number of tasks or products. People do not typically produce the full range of goods and services that they use or consume in their daily life. Instead we specialize, some producing one good, others producing other goods, some working as welders, others as teachers or farmers. For this reason, specialization—called the division of labour—poses a problem for society: how are the goods and services to be distributed from the producer to the final user? In the course of history, this has happened in a number of distinct ways, from direct government requisitioning and distribution as was done in the US and many economies during the Second World War, to gifts and voluntary sharing as we do in families today and as practiced among even unrelated members of a community by our hunting and gathering ancestors. Capitalism enhanced our opportunities for specialization by expanding the economic importance of both markets and firms. Specialization exists within governments and also in families, where who does which household chore is often associated with age and gender. Here we look at the division of labour in firms and in markets. He went on to describe a pin factory in which the specialization of tasks among the working men allowed a level of productivity—pins produced per day—that seemed to him extraordinary. Firms may employ thousands or even hundreds of thousands of individuals, most of them working at specialized tasks under the direction of the owners or manager of the firm. This description of the firm stresses its hierarchical nature from top to bottom. But you can also think of the firm as a means by which large numbers of people, each with distinct skills and capacities, contribute to a common outcome, the product. The firm thus facilitates a kind of cooperation among specialized producers that increases productivity. We return to the question of who does what within the firm and why in Unit 6. When you hear the word ‘market’ what word do you think of? ‘Competition’ probably is what came to mind. And you would be right to associate the two words. But you might have also come up with ‘cooperation’. Why? Because markets allow each of us pursuing our private objectives to work together, producing and distributing goods and services in a way that, while far from perfect, is in many cases better than the alternatives. Markets accomplish an extraordinary result: unintended cooperation on a global scale. The people who produced the phone on your desk did not know or care about you; they produced it rather than you because they are better at producing phones than you are, and you ended up with it because you paid them, allowing them to buy goods that they need, also produced by total strangers to them. A simple example illustrates how, when people differ in their ability to produce different goods, markets allow them to specialize. It shows something surprising: all producers can benefit by specializing and trading goods, even when this means that one producer specializes in a good that another could produce at lower cost. Imagine a world of just two individuals (Greta and Carlos) who each need both of two goods, apples and wheat, to survive. They differ in how productive they are in growing apples and wheat. If Greta spent all her time, say, 2,000 hours in a year, producing apples, she would produce 1,250. If she only produced wheat, she would produce 50 tonnes per annum. Carlos has less fertile land than Greta for producing both crops: if he devoted all his time (the same amount as Greta) to apple growing, he would produce 1,000 per year, and if he produced only wheat he would produce 20 tonnes. See Figure 1.9a for a summary. Figure 1.9a Absolute and comparative advantage in the production of apples and wheat. Although Carlos’ land is worse for producing both crops, his disadvantage is less, relative to Greta, in apples than in wheat. Greta can produce two and a half times more wheat as he can but only 25% more apples. Economists distinguish who is better at producing what in two ways: absolute advantage and comparative advantage. Greta has an absolute advantage in both crops. Carlos has an absolute disadvantage. She can produce more of either crop than he can. Greta has a comparative advantage in wheat; Carlos has a comparative advantage in apples. Although she is better, Carlos is least disadvantaged in producing apples. Greta has a comparative advantage in producing wheat. Initially, Carlos and Greta are not able to trade with each other. Both must be self-sufficient, consuming exactly what they produce, so they will each produce both goods in order to survive. Greta chooses to use 40% of her time in apple production, and the rest producing wheat. Column 1 of Figure 1.9b shows that she produces and consumes 500 apples and 30 tonnes of wheat. Carlos’ consumption is also shown: he spends 30% of his time producing apples, and 70% producing wheat. Now suppose that there are markets where apples and wheat may be bought and sold, and that 40 apples can be bought for the price of 1 tonne of wheat. If Greta specializes in growing wheat only, producing 50 tonnes of wheat and no apples, while Carlos specializes in apples, total production of both crops will be higher than it was under self-sufficiency (column 2). Then they can each sell some of their own crop in the market, and buy some of the good that the other produced. For example, if Greta sells 15 tonnes of wheat (column 3) in order to buy 600 apples, she can now consume more apples and more wheat than before (column 4). And the table shows that buying the 15 tonnes of wheat produced by Greta, in return for 600 apples, similarly enables Carlos to consume more of both goods than was possible in the absence of specialization and trade. Figure 1.9b Comparing self-sufficiency and specialization. Under self-sufficiency, both consume exactly what they produce. Under complete specialization, Greta produces only wheat; Carlos produces only apples; and they trade the surplus of their production above what they consume. In constructing this example we assumed market prices are such that a tonne of wheat could be exchanged for 40 apples. We will return to how markets work in Units 7 to 12, but Exercise 1.10 shows that this assumption was not critical. There are other prices at which both Greta and Carlos would benefit from trading with each other. The opportunity to trade—that is, the existence of an apple market and a wheat market—has benefited both Greta and Carlos. This was possible because specializing in the production of a single good increased the total amount of each good produced, from 800 to 1,000 apples and from 44 to 50 tonnes of wheat. The surprising thing mentioned above is that Greta ended up buying 600 apples from Carlos even though she could have produced those apples at a lower cost herself (in terms of labour time). This was a better way to spend their time because while Greta had an absolute advantage in producing both goods, Carlos had a comparative advantage in producing apples. Markets contribute to increasing the productivity of labour—and can therefore help to explain the hockey stick of history—by allowing people to specialize in the production of goods for which they have a comparative advantage, that is the things at which they are—relatively speaking—least bad! Suppose that market prices were such that 35 apples could be bought for 1 tonne of wheat. If Greta sold 16 tonnes of wheat, would both she and Carlos still be better off? What would happen if only 20 apples could be bought for the price of a tonne of wheat? We have seen that the institutions associated with capitalism have the potential to make people better off, through opportunities for both specialization and the introduction of new technologies, and that the permanent technological revolution coincided with the emergence of capitalism. But can we conclude that capitalism caused the upward kink in the hockey stick? In science, we support the statement that X causes Y by understanding the relationship between cause (X) and effect (Y) and performing experiments to gather evidence by measuring X and Y. But an economy is made up of the interactions of millions of people. We cannot measure and understand them all, and it is rarely possible to gather evidence by conducting experiments (though in Unit 4 we will give examples of the use of conventional experiments in one area of economics). So how can economists do science? This example shows how the things we observe in the world can help us investigate causes and effects. How economists learn from facts Do institutions matter for growth in income? Scholars in all fields try to narrow the range of things on which they disagree by using facts. For complicated economic questions, like ‘Do institutions matter economically?’, facts may provide enough information to reach a conclusion. A method for doing this is called a natural experiment. It is a situation in which there are differences in something of interest—a change in institutions for example—that are not associated with differences in other possible causes. Because we cannot change the past, even if it were practical to conduct experiments on entire populations, we rely on natural experiments. In this interview, Jared Diamond, a biologist, and James Robinson, a professor of government, explain. In 1936, before the Second World War, living standards in what later became East and West Germany were the same. This is a suitable setting for using the natural experiment method. Before the war, firms in Saxony and Thuringia were world leaders in automobile and aircraft production, chemicals, optical equipment and precision engineering. With the introduction of centralized planning in East Germany, private property, markets and firms virtually disappeared. Decisions about what to produce, how much and in which plants, offices, mines and farms were taken not by private individuals, but by government officials. The officials managing these economic organizations did not need to follow the principle of capitalism and produce goods and services that customers would buy at a price above their cost of manufacture. West Germany remained a capitalist economy. The East German Communist Party forecast in 1958 that material wellbeing would exceed the level of West Germany by 1961. The failure of this prediction was one of the reasons the Berlin Wall separating East from West Germany was built in 1961. By the time the Berlin Wall fell in 1989, and East Germany abandoned central planning, its GDP per capita was less than half of that of capitalist West Germany. Figure 1.10 shows the different paths taken by these and two other economies from 1950. It uses the ratio scale. West German GDP grew faster than East German GDP between 1950–89. Figure 1.10 The two Germanies: Planning and capitalism (1950–89). Not every capitalist country is the kind of economic success story exemplified in Figure 1.1a by Britain, later Japan, and the other countries that caught up. Figure 1.11 tracks the fortunes of a selection of countries across the world during the twentieth century. It shows for example that in Africa the success of Botswana in achieving sustained growth contrasts sharply with Nigeria’s relative failure. Both are rich in natural resources (diamonds in Botswana, oil in Nigeria), but differences in the quality of their institutions—the extent of corruption and misdirection of government funds, for example—may help explain their contrasting trajectories. The star performer in Figure 1.11 is South Korea. In 1950 its GDP per capita was the same as Nigeria’s. By 2013 it was ten times richer by this measure. 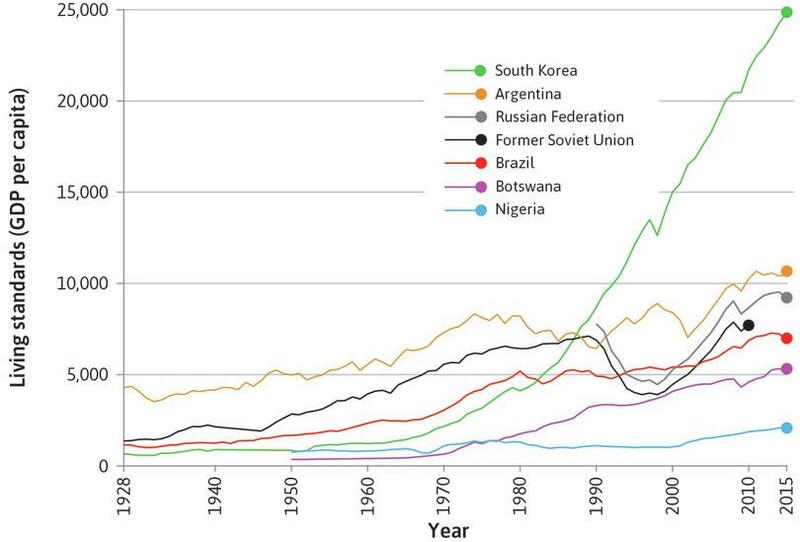 Between 1928 and 2015, the GDP of South Korea grew much more than that of Argentina, Russia (the former Soviet Union), Brazil, Botswana and Nigeria. 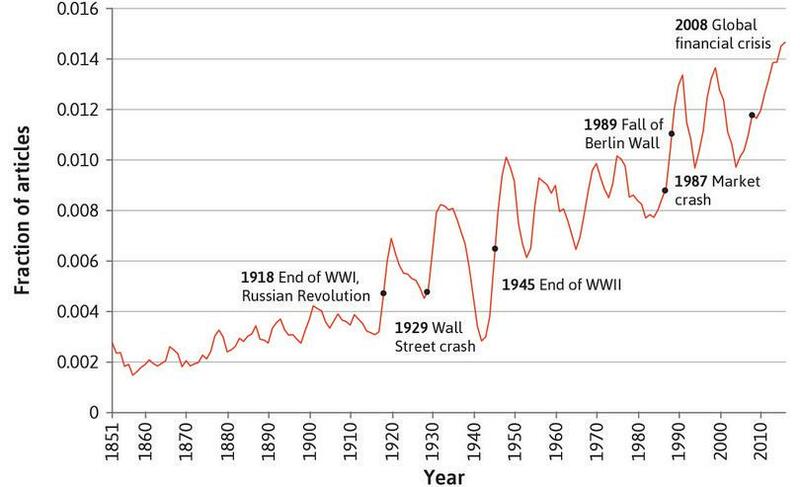 Figure 1.11 Divergence of GDP per capita among latecomers to the capitalist revolution (1928–2015). From Figure 1.11 we also see that in 1928, when the Soviet Union’s first five-year economic plan was introduced, GDP per capita was one-tenth of the level in Argentina, similar to Brazil, and considerably higher than in South Korea. Central planning in the Soviet Union produced steady but unspectacular growth for nearly 50 years. GDP per capita in the Soviet Union outstripped Brazil by a wide margin and even overtook Argentina briefly just before Communist Party rule there ended in 1990. The lagging performances of some of the economies in Figure 1.11 demonstrate that the existence of capitalist institutions is not enough, in itself, to create a dynamic economy—that is, an economy bringing sustained growth in living standards. Two sets of conditions contribute to the dynamism of the capitalist economic system. One set is economic; the other is political, and it concerns the government and the way it functions. Private property is not secure: There is weak enforcement of the rule of law and of contracts, or expropriation either by criminal elements or by government bodies. Markets are not competitive: They fail to offer the carrots and wield the sticks that make a capitalist economy dynamic. Firms are owned and managed by people who survive because of their connections to government or their privileged birth: They did not become owners or managers because they were good at delivering high-quality goods and services at a competitive price. The other two failures would make this more likely to occur. Capitalism is the first economic system in human history in which membership of the elite often depends on a high level of economic performance. As a firm owner, if you fail, you are no longer part of the club. Nobody kicks you out, because that is not necessary: you simply go bankrupt. An important feature of the discipline of the market—produce good products profitably or fail—is that where it works well it is automatic, because having a friend in power is no guarantee that you could remain in business. The same discipline applies to firms and to individuals in firms: losers lose. Market competition provides a mechanism for weeding out those who underperform. Think of how different this is from other economic systems. A feudal lord who managed his estate poorly was just a shabby lord. But the owner of a firm that could not produce goods that people would buy, at prices that more than covered the cost, is bankrupt—and a bankrupt owner is an ex-owner. Of course, if they are initially very wealthy or very well connected politically, owners and managers of capitalist firms survive, and firms may stay in business despite their failures, sometimes for long periods or even over generations. Losers sometimes survive. But there are no guarantees: staying ahead of the competition means constantly innovating. Government is also important. We have seen that in some economies—South Korea, for example—governments have played a leading role in the capitalist revolution. And in virtually every modern capitalist economy, governments are a large part of the economy, accounting in some for more than half of GDP. But even where government’s role is more limited, as in Britain at the time of its take-off, governments still establish, enforce and change the laws and regulations that influence how the economy works. Markets, private property and firms are all regulated by laws and policies. As Adam Smith warned, by creating or allowing monopolies such as the East India Company, governments may also take the teeth out of competition. If a large firm is able to establish a monopoly by excluding all competitors, or a group of firms is able to collude to keep the price high, the incentives for innovation and the discipline of prospective failure will be dulled. The same is true in modern economies when some banks or other firms are considered to be too big to fail and instead are bailed out by governments when they might otherwise have failed. In addition to supporting the institutions of the capitalist economic system, the government provides essential goods and services such as physical infrastructure, education and national defence. In subsequent units we investigate why government policies in such areas as sustaining competition, taxing and subsidizing to protect the environment, influencing the distribution of income, the creation of wealth, and the level of employment and inflation may also make good economic sense. Firms led by those with proven ability to produce goods at low cost. Public policy supporting these conditions: Public policy also supplies essential goods and services that would not be provided by private firms. A stable society, biophysical environment and resource base: As in Figures 1.5 and 1.12. These are the conditions that together make up what we term the capitalist revolution that, first in Britain and then in some other economies, transformed the way that people interact with each other and with nature in producing their livelihoods. One of the reasons why capitalism comes in so many forms is that over the course of history and today, capitalist economies have coexisted with many political systems. A political system, such as democracy or dictatorship, determines how governments will be selected, and how those governments will make and implement decisions that affect the population. Capitalism emerged in Britain, the Netherlands, and in most of today’s high-income countries long before democracy. In no country were most adults eligible to vote prior to the end of the nineteenth century (New Zealand was the first). Even in the recent past, capitalism has coexisted with undemocratic forms of rule, as in Chile from 1973 to 1990, in Brazil from 1964 to 1985, and in Japan until 1945. Contemporary China has a variant of the capitalist economic system, but its system of government is not a democracy by our definition. In most countries today, however, capitalism and democracy coexist, each system influencing how the other works. Like capitalism, democracy comes in many forms. In some, the head of state is elected directly by the voters; in others it is an elected body, such as a parliament, that elects the head of state. In some democracies there are strict limits on the ways in which individuals can influence elections or public policy through their financial contributions; in others private money has great influence through contributions to electoral campaigns, lobbying, and even illicit contributions such as bribery. These differences even among democracies are part of the explanation of why the government’s importance in the capitalist economy differs so much among nations. In Japan and South Korea, for example, governments play an important role in setting the direction of their economies. But the total amount of taxes collected by government (both local and national) is low compared with some rich countries in northern Europe, where it is almost half of GDP. We shall see in Unit 19 that in Sweden and Denmark, inequality in disposable income (by one of the most commonly used measures) is just half of the level of income inequality before the payment of taxes and receipt of transfers. In Japan and South Korea, government taxes and transfers also reduce inequality in disposable income, but to a far lesser degree. Look again at Figure 1.10, which shows a graph of GDP per capita for West and East Germany, Japan and Spain between 1950 and 1990. Which of the following statements is correct? The difference in East and West Germany’s performance proves that capitalism always promotes rapid economic growth while central planning is a recipe for stagnation. Different economic systems can be successful. The Japanese economy had its own particular combination of private property, markets and firms along with a strong government coordinating role, which was different to the West Germany system. The growth rate of an economy’s GDP per capita can be inferred from the steepness of its curve when plotted on a ratio scale graph, as done here. The fact that the slope of Spain’s curve is greater than that of either West or East Germany from 1950 to 1990 indicates that it grew at a faster rate. In economics one cannot use only one piece of evidence to ‘prove’ a theory. What we can infer here is that during the second half of the twentieth century, the divergence of economic institutions mattered for the livelihoods of the German people. Look again at Figure 1.11. Which of these conclusions is suggested by the graph? The contrasting performances of Botswana and Nigeria illustrate that rich natural resources alone do not guarantee higher economic growth, but that higher quality institutions (government, markets and firms) may also be necessary. How we interact with each other: Either as buyers and sellers, employees or employers, citizens and public officials, parents, children and other family members. 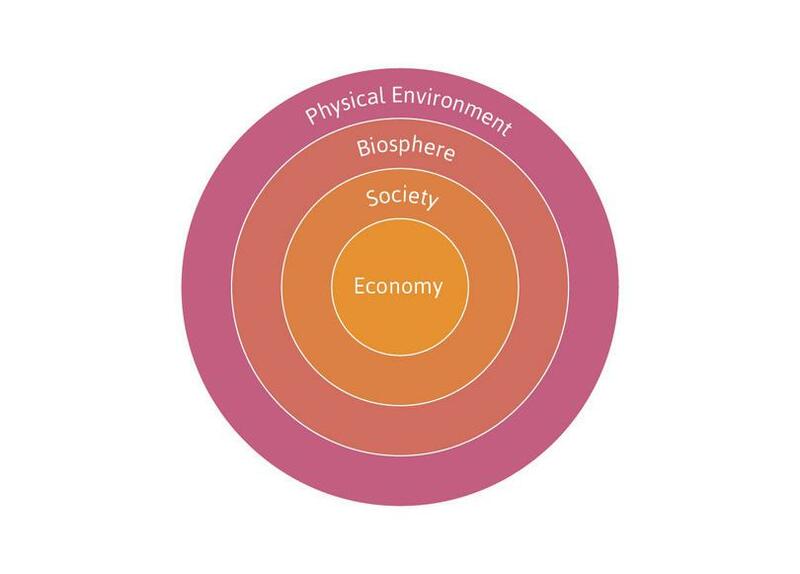 In Figure 1.5 we showed that the economy is part of society, which in turn is part of the biosphere. Figure 1.12 shows the position of firms and families in the economy, and the flows that occur within the economy and between the economy and the biosphere. Firms combine labour with structures and equipment, and produce goods and services that are used by households and other firms. Figure 1.12 A model of the economy: Households and firms. Production of goods and services also takes place within households, although unlike firms, households may not sell their outputs in the market. In addition to producing goods and services, households are also producing people—the next generation of the labour force. The labour of parents, caregivers and others is combined with structures (for example, your home) and equipment (for example, the oven in that home) to reproduce and raise the future labour force working in firms, and the people who will work and reproduce in the households of the future. All of this takes place as part of a biological and physical system in which firms and households make use of our natural surroundings and resources, ranging from fossil-fuel or renewable energy to the air we breathe. In the process, households and firms transform nature by using its resources, but also by producing inputs to nature. Currently, some of the most important of these inputs are the greenhouse gases, which contribute to the climate change problems that we saw in Section 1.5. Exercise 1.11 Where and when would you choose to have been born? Suppose you can choose to be born in any time period in any of the countries in Figure 1.1a, 1.10 or 1.11, but you know that you would be among the poorest 10% in the population. In which country would you choose to be born? Now suppose, instead, you know you would initially be among the poorest 10% in the population, but you would have a fifty-fifty chance of moving to the top 10% of the population if you work hard. In which country would you now choose to be born? Now suppose that you can only decide on the country and time period of your birth. You cannot be sure if you would be born in the city or the countryside, would be male or female, rich or poor. In which time and country would you choose to be born? For the scenario in (3), in which time and country you would least want to be born? Use what you have learned from this unit to explain your choices. Throughout most of history, living standards were similar around the world and changed little from century to century. Since 1700 they have risen rapidly in some countries. This upturn coincided with rapid technological progress, and with the advent of a new economic system, capitalism, in which private property, markets and firms play a major role. The capitalist economy provided incentives and opportunities for technological innovation, and gains from specialization. Countries differ in the effectiveness of their institutions and government policy: not all capitalist economies have experienced sustained growth. Today, there are huge income inequalities between countries, and between the richest and poorest within countries. And the rise in production has been accompanied by depletion of natural resources and environmental damage, including climate change. Robison, Jennifer. 2011. ‘Happiness Is Love – and $75,000’. Gallup Business Journal. Updated 17 November 2011. Sutcliffe, Robert B. 2001. 100 Ways of Seeing an Unequal World. London: Zed Books.